This nation of Israel was built by Holocaust survivors, Russian emigrants, and refugees from Europe, Russia, Morocco and beyond. Each one brought with them their unique culinary heritage and mixed it with a cocktail of Middle East traditions and locally-grown ingredients. My Israeli pilgrimage of flavors has been delicious. From the first day I arrive in Tel Aviv the aromas and flavors are as seductive as the sun at this Mediterranean latitude. My taxi driver is typically brusque, yet he weaves in and out or traffic with a certain grace and finesse. We pass street vendors offering freshly squeezed orange and pomegranate juice. I spot large steaming pots of fava beans, pita bread, and falafel amidst creamy mounds of hummus. Israel is one of the healthiest countries in the world according to rankings compiled by Bloomberg, and it's clear that the fresh whole cuisine has a lot to do with it. My appetite is interwoven throughout the journey, and yet the azure blue Mediterranean takes my first attention. I arrive on an unusually warm February day. Paying no heed to the "no-swimming signs" festooning the beach, young, sleek Israelis wade and frolic in the cool water. Youthful army soldiers bear automatic rifles nonchalantly as they stroll down the promenade. This is a place of beauty and contradictions; there is a certain vibrancy and defiance - pleasure and danger - hedonism and cultural struggle. Despite the political turmoil, there is really one amazing mélange of cuisine. That's what I am after! The hotel is precariously close to the Carmel Market, and my first excursion leads me to this famous outdoor market overflowing with all manner of fine Israeli provisions. There are cascades of variegated eggplant and elongated cucumbers nestled against dark ruby cherry tomatoes. The olive vendors bear every hue and wrinkle of the iconic Mediterranean fruit. My olive oil runneth over. Other stalls proffer a myriad of brined cheeses whose recipes originate from Bulgaria, Greece or Romania, now fermented proudly in Israel. The salty traditions of herring, mackerel and lox are laid out for the taking. 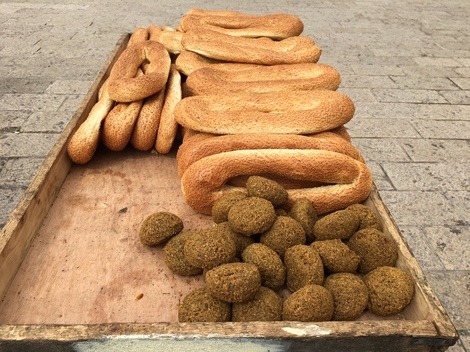 Bread stalls overflow with a combination of earthy Arab flatbreads, Middle Eastern pitas, pillowy challah and dark honest rye. The cabbages are as large as beach balls and the strawberries as big as a fist. I could have a dance with the leeks and celery they are so tall and lanky. It is now time to eat and so I sit and enjoy the simple flavor of local street food: A Shawarma sandwich which is an entire freshly-baked round of pita vigorously stuffed with velvety hummus, succulent lamb and chicken, and a kind of coleslaw put to rest on a bed of herbs. I sit amongst the myriad vendors and eat this surprisingly moist hand-held meal; I am awash with savory flavors of the Middle East. The next day, I embark on the train to Beer Sheva, Abraham's ancient city of seven wells that's now a frontier town on the go and growing. As I exit Tel Aviv, the countryside sprouts housing developments and then gives way to fields of orderly tree crops. Orange groves, undulating vineyards, verdant olives, blooming plums, and kiwi fruit, nestled amidst the white stone housing developments. Peaches, apricots and almonds are in their first blush of bloom. I spot an occasional Arab Bedouin herding her sheep. As the train pushes south, the fruit trees surrender to long lush rolling plains of timothy and alfalfa, as far as the eye can see. This is green fodder for the bovines that produce the salty brined cheeses I have savored. If I were to continue traveling south, my view would soon include date palms and bananas. This is truly a land of agricultural abundance and diversity. It is also a land of rich human diversity. Much of this land has been reclaimed and planted from the desert and it reminds me very much of California. Yet this is a California surrounded by Ayatollahs and large Arab Nations, by Syrian civil war and occupied Palestinian homelands. There is much strife in the region. This nation of Israel was built by Holocaust survivors, Russian emigrants, and refugees from Europe, Russia, Morocco and beyond. Each one brought with them their unique culinary heritage and mixed it with a cocktail of Middle East traditions and locally-grown ingredients. It is a melting pot of people and food, a land of culinary contradictions and food occupations. A plate of old-world Europe served up with Arabic traditions and Far East spices. I experience this Mediterranean mélange and it gives me a glimmer of hope. One of my last meals, before I head home, is a fine Chicken Schnitzel, much like my German grandmother used to pound, bread and fry when I was a child. But this Schnitzel is different. It is surrounded by oval Arabic flatbread, Kalamata-style olives, baba ganoush, falafel and halva. This schnitzel meal represents a marriage of all the divergent factions and struggles coming together in union on one plate. Could this simple schnitzel surrounded by its host of Mediterranean delights provide a certain kind of hope? Could the skirmishes and rocket launches be someday set aside for forks and knives as the peoples break mutual bread and realize they are one nation under food? For now, I wax hopeful and savor another bite of Schnitzel, hummus and black olive. I think peace can be won from nourishment such as this.